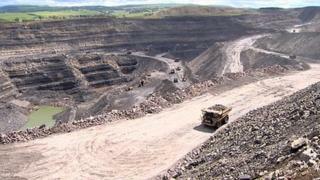 East Ayrshire Council has sacked its head of planning over a £132m shortfall to restore former opencast mine sites. The huge clean-up bill was left behind by the collapse last year of Scottish Coal and another firm, ATH Resources. Alan Neish was dismissed after a disciplinary hearing on Tuesday. He has a right to appeal the decision. The action came after an independent review of the council's planning authority role highlighted widespread failures among officials. In a statement, the council said: "Following receipt of the report of the Independent Review of Regulation of Opencast Coal Operations in East Ayrshire, the council agreed on 28 January 2014 to a further, formal internal disciplinary investigation which considered the roles and conduct of various officers across a range of services relative to the previous operation of these sites." It added: "That investigation in turn led to formal disciplinary proceedings being taken against certain individuals, including the Head of Planning and Economic Development, in respect of whom the decision has now been taken to dismiss him from his employment with the council, with immediate effect." In the immediate aftermath of the mining firms collapse, East Ayrshire Council set up an independent review of its planning process in relation to opencast mines. A three-man team, led by former Scottish government chief planner Jim Mackinnon, delivered a damning report on how East Ayrshire officials handled their statutory duties. The report found that opencast sites in East Ayrshire "were not visited or inspected on a regular basis" and that "monitoring progress on sites was wholly inadequate". The review panel described a failure by council officials "to appoint independent assessors" as "completely inexplicable". It concluded that there were "significant management and communication failings, particularly within the planning service" and that this statutory role was "not given the priority that was required in relation to the operations of opencast coal operators". The report said there was a lack of awareness within the senior management of East Ayrshire Council of the environmental damage wreaked by the operators and the financial implications. Mr Mackinnon said the fallout from the mining firms' collapse, and the subsequent shortfall in clean-up funds, was "as bad as it gets" for East Ayrshire. "It has left a legacy of environmental dereliction which is probably unrivalled anywhere in Scotland," he said. Mr Mackinnon said the council had policies in place to deal with potential problems but there were "consistent and persistent" failings. The council has said it has no statutory duty or legal obligation to meet the shortfall for restoring the opencast sites.